Dunkirk consists of the main town and a number of smaller villages. One of these is Malo-les-Bains (not to be confiused with the Saint-Malo in Brittany) The Kursaal is situated in Malo-les-Bains, a place where exhibitions and trade fairs take place. It is near the seafont. In the immediate vicinity are lots of restaurants and bars. Car parking can be difficult at times, especially when there is an event at the Kursaal. 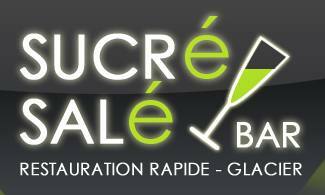 One of the smaller restaurants is "Bar Sucré-Salé". I went there for a quick bite, and chose a sandwich "Le Port". This is a nearly one foot long baguette stuffed with ham, lettuce, tomato and mayonaise. I paid €3.20 for this giant sandwich. As the name of the place does suggest, one can eat both sweet and savory food here. Besides a large assortment of sandwiches, there are also waffles, pancakes and ice-cream on sale. My sandwich was well-stuffed with two slices of ham, three slices of tomato and lots of lettuce and mayo. A pity the baguette itself was of the pre-cooked type. An understandable choice for the owner, since this makes him independent from any bakery, but the downside is it has less taste than a "real" baguette. When you visit Dunkirk and end up in Malo-les-Bains, you can take a look at the remains of the shipwrecks from the 1940 Operation Dynamo, the evacuation of more than three-hundred-thousand (!) British troops.